Based on a study led by researchers at PNNL, weather forecasters may someday be able to reliably predict the intensity of tropical cyclones as well as their tracks (shown here based on data from the Joint Typhoon Warning Center’s Best Track Database). The study showed how small errors in models have larger effects on results. Photo courtesy of Wikimedia Commons License. Enlarge Image. Results: For the first time, an international team of scientists led by researchers at Pacific Northwest National Laboratory simulated Indian Ocean tropical cyclones to investigate how model errors grow. Using very high-resolution models, their research found that in the tropical cyclone environments, model errors begin to grow in calculations over small regions and continue to build from local to regional scales. The scientists also discovered that errors at small scales grow faster than those at larger scales, even in sophisticated models that explicitly simulate processes involving clouds and rain. "The sorts of errors we found ultimately limit the ability to predict Indian Ocean tropical cyclones," said Dr. Sourav Taraphdar, atmospheric researcher at PNNL, who led the team. "Solving those errors will improve our ability to forecast cyclone direction and intensity." Why It Matters: At $26 billion a year in damages, tropical cyclones are the costliest and often deadliest natural hazards on the planet. Predicting the direction and intensity of cyclones remains challenging, with every weather model prone to at least minor errors. In the past few decades, significant progress has been made in predicting the direction a cyclone will take but very little improvement has been made in forecasting its strength and destructive potential. Lowering fatalities is directly tied to the ability to reliably predict the track and intensity of a cyclone, according to the World Meteorological Organization. Scientists in this study are working to develop a better understanding of how forecasting errors grow and limit predictability, which could lead to improved modeling of cyclones. Improvements in forecasting cyclone power and direction could save thousands of lives. 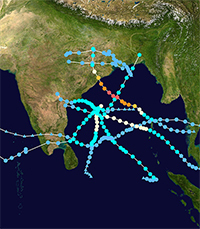 Methods: PNNL scientists and their collaborators at the Indian Institute of Tropical Meteorology and Pennsylvania State University used the Weather Research & Forecasting Model (WRF v3.4), a regional weather prediction model, to simulate conditions in the Indian Ocean, with only small differences among the initial scenarios. These simulations estimated how the model handled error growth. The team then computed how quickly errors doubled and conducted a number of experiments to determine how the errors built as spatial scales widened. 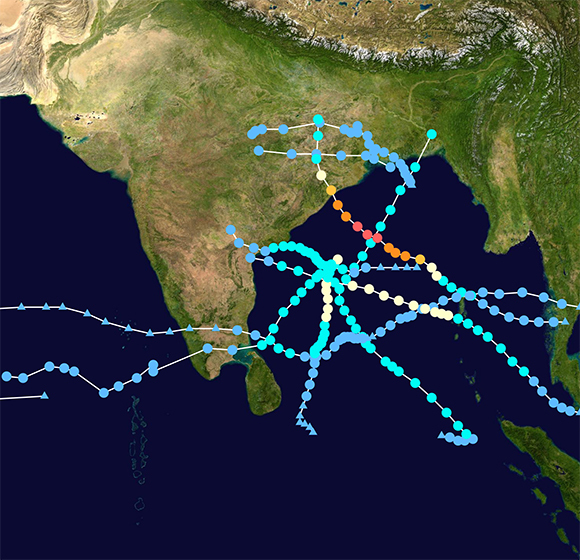 Scientists used cyclone track and intensity information on real storms from the India Meteorological Department to evaluate and compare model performance. Their research found that model errors begin to grow in calculations over small regions with strong convection and condensation and continue to build from local to regional scales. What's Next? Scientists will investigate the role of clouds and precipitation at various scales on the birth and rapid intensification of cyclones and the implications for cyclone predictability. Sponsors: The U.S. Department of Energy Office of Science, Office of Biological and Environmental Research supported this research through the Regional & Global Climate Modeling Program. The India Meteorological Department provided information about the cyclone cases used in this study. Research Team: Sourav Taraphdar and L. Ruby Leung, Pacific Northwest National Laboratory; P. Mukhopadhyay, S. Abhilash, and B. N. Goswami, Indian Institute of Tropical Meteorology; and Fuqing Zhang, Pennsylvania State University. Reference: Taraphdar S, P Mukhopadhyay, LR Leung, F Zhang, S Abhilash, and BN Goswami. 2014. "The Role of Moist Processes in the Intrinsic Predictability of Indian Ocean Cyclone." Journal of Geophysical Research Atmosphere: 119. DOI:10.1002/2013JD021265.